Another fabulous plant to add to one’s garden. Our first Christia vespertilionis seedling arrived in our garden in December 2004 and its descendants are still scattering their seeds all over our garden till today, like the pretty Torenia fournieri! 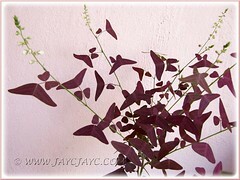 Light:Prefers sunlight for best foliage colour though can tolerate semi-shade to full-shade. Propagation: Can be propagated from herbaceous stem cuttings or germination of seeds which may take 4-8 weeks to sprout (remove dried seedheads from plant, break open and scatter the tiny seeds on moist potting mix). Or allow the plant to self-sow – we weren’t surprised at all by the many seedlings found sprouting around the parent plant or elsewhere in surrounding pots. Features: A deciduous annual or perennial shrub reaching a height of about 60-120cm and width of 50cm. Though seemingly fragile as a spindly plant and needs staking when it becomes too tall, it is robust and sways with the wind unscathed! 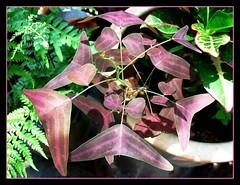 Christia vespertilionis is grown for its beautiful variegated foliage. 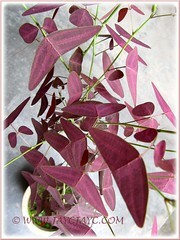 Leaves held on thin wiry petioles are in rare burgundy red tones and prominently veined in medium shades of pink. 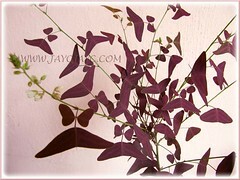 The foliage does appear in beautiful hues of purple. Sizes vary from 5-9 cm at its broadest. They are uniquely patterned like beautiful wings of a butterfly or wingspan of an aircraft or even resembling a swallow with spread wings. No wonder, this lovely plant is commonly named Butterfly Wing, Aircraft Grass or Bat Grass. Leaves hang downward (droop) during the night. Inconspicuous and small white or off-white flowers and seeds appear on slender raceme of 5-15 cm lengths at terminal growth. 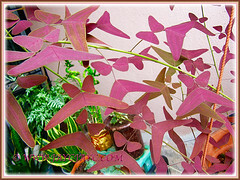 Usage: Red Butterfly Wing plant is most ideal in garden beds and borders to add variety, color and height. Great too for garden landscaping. And excellent for container gardening and as an indoor plant for patios, decks or porches, though best located where it can receive at least some indirect light. Care: A low maintenance shrub that requires minimal attention. Light pruning if necessary to keep it low. Though hardly bothered by pests, do check occasionally for white flies to prevent infestation. For temperate zones: Hardiness: USDA Zone 10a-11. There are many Christia vespertilionis cultivars, though the only other that I’ve seen besides the kind we grow is with green leaves and marked with deep maroon veins. Quite a pretty one too, I’d say! View more Christia vespertilionis images that include other coloured varieties at images.google.com! just wonder if you notice that the leaves will fold down at night ? that was what caught my attention and wanted to plant it in my garden. sadly, it is hard to find more info about the plant until i saw your site. 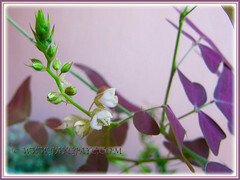 Every body bwould like to keep this…..
i’m interested in seeds of the beautiful christia, but i can’t find them anywhere. can you send me seeds to austria? Sorry to disappoint, jurgen….we’re not a garden nursery, just home-gardeners! I had this plant. It came fell under the attack of an evil cat and it never came back. I cried. The cat is now on a farm. I am searching for this plant. This plant moved to my fan in my bedroom. Like leaves in flight. I loved it so much. It was fine without light although I did mist it twice a day to keep it moist and talked to it everytday. If i could even try to start some more of seeds i would be so indebted to you. PLEASE help me,,,,,,i miss it so much. Thanks a lot, A. Belle! Will visit you shortly. hi, I’m interested to have this plant but the one with green colour leaves..do you have suggestion where can I find them? No idea, Norhanim! Sorry to disappoint. 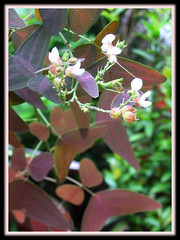 Nice blossoms flower you have.. How can I get the seeds.. Highly appreciated.. Pls update me asap.. Thanks.. [email protected].. 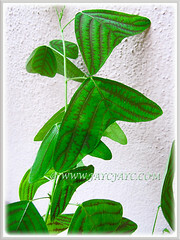 I was wondering where can u get this plant in Malaysia? Hi gadafi… you can buy this plant at some of the Sungai Buloh nurseries along Jalan Sungai Buloh in Selangor. Thanks Bangihijau. Sorry, not sure where you can get the seeds. I’m also looking for this..but in green color. 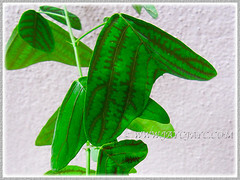 Hope you can update to us where we can find this plant with green color leaves. So sorry… I’ve no idea at all where you can buy the green-coloured variety. but now i’m so concern on why the leaves so easily fall out & yellowing ? What I’ve observed is that its leaves easily dry up and fall during very hot seasons. So, best to provide lots of water, but must be grown in well-drained soil to prevent water-logged, and enough sunlight (preferably morning to noon) but not harsh full sun in the afternoon. I saw this plant in 1992 at first. After then i bought this plant several times. I notice that the plant is very sensitive, perhaps this plant recognise its mentor (gardener) and it wants more attention. In absence of gardener it change itss colour (as my wife said ) It is true that leaves will fold down at night. 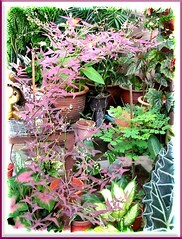 It’s a beautiful plant and we love that it self-sow easily till this day in our tropical garden. Hope your plant does that for you. It grows best when provided with lots of water, but must be grown in well-drained soil to prevent water-logged, and enough sunlight (preferably morning) for vibrant colour. My plant has only 1 long stem (it grown from seed) and it keep growing taller and taller. Can I cut off the top 2 leave so that it can grow with more branches? Will that hurt the plant? Thank you for your advice. Yes, you can prune it to about a foot from its base to encourage more branches. It wouldn’t hurt the plant as it likes a ‘haircut’ occasionally. All the best and may you plant grow to self-sow more plants for you to enjoy! I’m a fellow Gardner in Zone 8, looking for this plant since longtime and I came across your site. 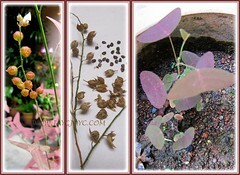 Can you please guide me where to find seeds or plants in USA ? Thanks for sharing Beautiful pictures and information.